The world is changing, and so are the agrarian struggles of rural social movements and their visions of agrarian reform, land, and territory.When the global peasant movement, La Via Campesina, met in the early 1990s, the “classic” reformist and revolutionary agrarian reforms of previous decades were at that time being reversed through counter reforms led by the World Bank and its land administration and titling programs. Earlier, however, capitalist governments had implemented limited agrarian reforms to replace unproductive large land holdings with more productive and dynamic family farms to boost food production for the urban labor force and consequently national economies. But these were rolled back by the new reforms designed to create functioning land markets aimed at attracting investments to rural areas, inevitably leading to the re-concentration of landholdings. Though the Bank dressed up this privatization of communal and public lands as “market-assisted land reform,” the net effects ran contrary to the interests of peasants. These trends motivated LVC to create the Global Campaign for Agrarian Reform (GCAR), with FIAN International and the Land Research Action Network as partners. GCAR was created to supportal ready existing struggles for agrarian reform in promoting new initiatives, and to carry out international lobby and solidarity work and engage in dialogue (e.g.with the FAO) and/or initiate protest(e.g.against the WorldBank) directed at international institutions dealing with land issues. Another key element was(and still is) having an emergency network that responded to situations of actual or imminent violations of the human rights of peasants struggling for land. In the year 2000, LVC held its third International Conference in Bangalore, where the first detailed analysis of what food sovereignty and agrarian reform meant was generated. LVC analyzed the limited capitalist or bourgeois agrarian reforms of the past, and those carried out by socialist governments, highlighting the limitations of the capitalist agrarian reforms and the worst-case situations of those countries that had benefitted from neither. A significant rise in landlessness as a result of a decade of neoliberal policies was observed. At the Bangalore conference, agrarian reform was defined as a “broad process of distribution of land ownership.” Emphasis was placed on individual family plots. In a foreshadowing of what LVC would later call “genuine” or “integral agrarian reform,” the argument made was that mere land distribution would not be enough to ensure the well-being of peasant families, and that therefore agrarian reform would have to include major changes in the overall ‘policy environment’ for peasant agriculture (trade, credit, crop insurance, education, democratic access to water and seeds, other support services, etc). For the first time, agrarian reform was linked to achieving food sovereignty, the major new paradigm being launched by LVC at the same conference. Land was to be distributed to produce food for people rather than products to be exported for use of the global economy.In strategic terms, land reform was pitched not as an exclusive struggle of peasants, but rather as a solution to many of the larger problems of society. Later,a key encounter took place in March 2006 in Porto Alegre, Brazil. The “Land,Territory and Dignity” Forum was organized by LVC and other international organizations in the days immediately preceding the International Conference on Agrarian Reform and Rural Development, hosted by the FAO and attended by member states. The collective analysis led to a call to re-envisioned agrarian reform with a territorial perspective, so that the distribution of land to peasants would no longer mean a truncation of the rights of pastoralists to seasonal grazing areas, fisher folks to fishing sites, and forest dwellers to forests. Porto Alegre also reflected a persistent emphasis on the obligation of states and the re-vindication of land occupation as a tool of struggle. Still later, a global land reform meeting of LVC held in 2012 in Bukit Tinggi, Indonesia, and the 2016 International Agrarian Reform conference in Marabá, Brazil, became opportunities to re-think “agrarian reform for the 21st century.” These gatherings focused on what had changed in the world, and on the strategy and tactics that the agrarian reform movement should develop to meet new challenges. In Brazil, for example, the land available for land reform and thus suitable for occupation had shifted dramatically in previous years as a result of the recent waves of capitalization of agribusiness. For example, unproductive large landholdings or ‘latifundios‘ — once the main target of peasant ire and land occupations — had largely become productive agribusiness export platforms. Thus, the argument used historically in the dispute for public opinion lost its relevance. It no longer made as much sense to argue about the essential unfairness of the majority of the land being in the hands of a few “who do not even use it,” while millions who desperately needed land have none at all. Today, the Landless Workers Movement increasingly targets occupations of lands used in agribusiness and argues forcefully about the benefits for all of society and for the environment of peasant agriculture producing food without agrotoxics. MST contrasts this with the damage wrought by large-scale industrial monoculture for export and agrofuels. This is mirrored in the overall evolution of LVC discourse against TNCs and financial capital, and toward the benefits of peasant and family farm agriculture for building food sovereignty, growing healthy food, slowing global warming, and taking care of Mother Earth. “We are witnessing the emergence of an alliance between financial capital, transnational corporations, imperialism, broad sectors within national states (almost without regard to their purported ideology), particularly but not only judicial and public security institutions, the private sectors in industrial agriculture, fishing and food (including agribusiness and aquaculture), mining, construction, forestry and other extractive sectors, and the mainstream media. The members of this new alliance are promoting an avalanche of privatizations, grabbing and taking over the commons and public goods, such as land, water resources, forests, seeds, cattle raising, fisheries, glaciers, and entire territories. “The emergence of this new alliance between financial capital, agribusiness,the state and mass media — and its capacity to dispute territories, public opinion and the state, even where the government is ‘progressive’— has forced us once again to carry out a process of reflection and reformulation of our concepts and proposals, as well as our strategies, and forms and practices of struggle…. we have seen how financial capital has transformed the old enemy of peasants and landless workers— the unproductive large landholdings or latifundios — into capitalized agribusinesses, mines, industrial fishing and aquaculture, and energy projects. In reality, all these so-called ‘productive’ sectors are mostly producing extreme poverty and environmental devastation. A couple of points merit a bit more explanation. First, LVC has identified the mainstream media as part of the alliance against peasants both because of their role in demonizing social protest in order to create public opinion in support of the criminalization of activists and social movements, and because they have discovered that some of the same investment funds that back agribusiness and mining companies also hold substantial shares of key media outlets. Rather than a cross-class alliance, the new call is for a political alliance between working people in the countryside and in the city.Peasants can no longer count on the possibility of political alliance in favor of agrarian reform with urban factory owners and other segments of national capital. But that does not mean that peasants alone can have sufficient political weight to push for land reform. They still need allies. But the alliance that LVC now believes must be built is between the popular sectors of the countryside and the city. In the countryside,these are the peasants, farming families, landless workers, indigenous people, pastoralists, artisan fisherfolk, and other small-scale producers of food. In the city,these are the slum dwellers and those who live in the favelas, whose population continues to swell as part of the rapidly growing urban periphery. A“poor-poor” alliance, rather than a “peasant-urban capitalist alliance” is the new strategy. What could be the basis for such an alliance? LVC believes that it is an urgent task for peasant organizations to show the urban poor that it is worth struggling together. Both are victims of land grabbing and displacement driven by speculative capital. Think of real estate development and gentrification in the city,and the dramatic expansion of agrofuel crops and mining concessions in the countryside. Most of those who live in the urban slums are recent migrants from the countryside, or the children or grandchildren of such migrants. Most still have family in the countryside engaged in peasant agriculture. Many move back and forth, bringing peasant products like fruit and cheese to sell in the neighborhoods. They plant corn (maize) and fruit trees in their back yards, raise chickens, and maintain many peasant characteristics. They understand each other. Together, these popular classes in the countryside and the city probably make up at least two-thirds of humanity. The potential for a powerful alliance clearly exists. The peasants’ organizations in LVC want to make this potential alliance into a reality. One way is by offering healthy and affordable food at farmers’ markets in poor neighborhoods. Marching together with the urban poor for the latter’s issues and inviting slum dwellers to peasant farming areas on weekends is another. The hope is that they can convince the urban poor that popular agrarian reform — one that is based on building an alliance among “popular classes”— is in the best interest of all poor people, not just the rural poor.That by replacing agribusiness monocultures that produce unhealthy GMO and pesticide-laden food with ecologically-farmed peasant produce, everyone will be better off. That peasant struggle can put an end to the pesticide contamination of urban drinking water caused by upstream agribusiness. And by using their creativity to extend a hand, or many hands, to their urban brethren. This essay by Peter Rosset is extracted from “LRAN Briefing Paper Series No. 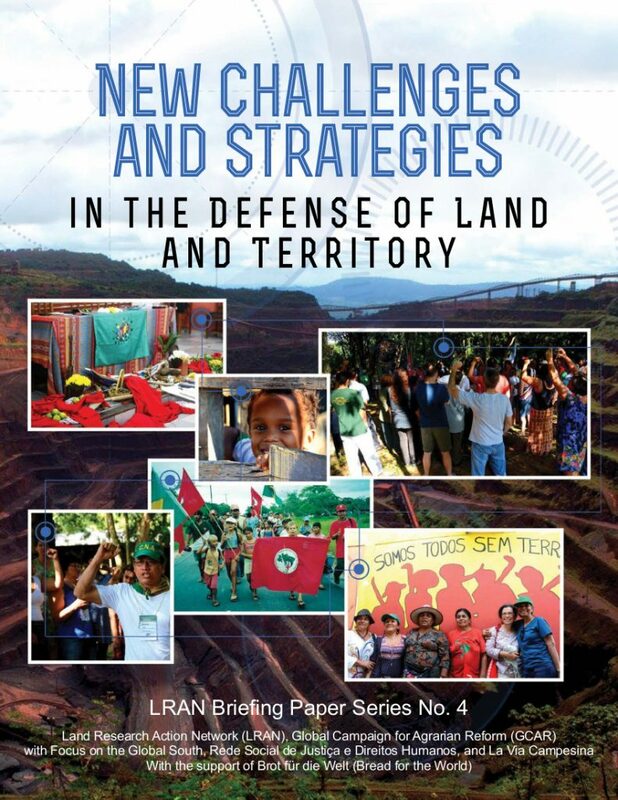 4 New Challenges and Strategies in the Defense of Land and Territory”, brought out by Land Research Action Network (LRAN), Global Campaign for Agrarian Reform (GCAR) with Focus on the Global South, Rede Social de Justiça e Direitos Humanos, and La Via Campesina.